To learn more about EverLine and the services we can bring you please select your location. 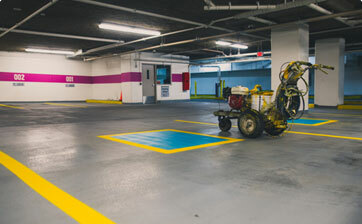 Our line painting services include parking lot line painting, parkade, parking garage line painting and interior line painting including floor marking projects. Using only the highest quality equipment and materials. At EverLine we offer a full suite of parking lot maintenance services such as sweeping services, power washing, sign & bollard installation, parking block & speed bump installation, custom stenciling and more. Asphalt sealcoating and crack filling ensures that you not only prevent the need to repave, but you extend the value of your original investment considerably. It also makes your asphalt look brand new. 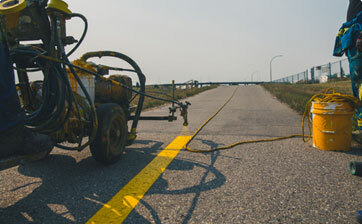 EverLine Coatings specializes in interior and exterior line painting services offered throughout Canada. In addition to our line painting services we also provide a variety of parking lot maintenance services. At EverLine Coatings and Services we use the highest quality products and equipment, in combination with highly trained professionals to provide you with an extraordinary end result. Our TBL Durables product cures quickly, is long lasting, and highly reflective. This means you will not have to have your parking lot painted nearly as often, saving your business time and money.